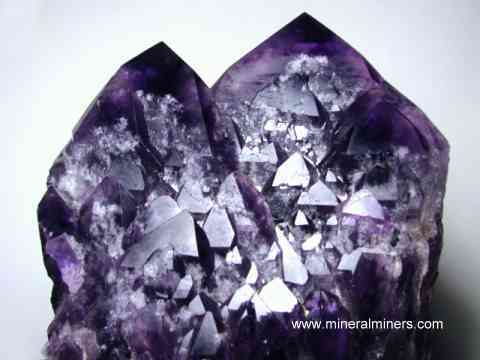 Try our natural amethyst satisfaction guarantee - compare our prices and our quality. Natural amethyst rough pieces with rich purple natural color were bezel set with open backs in this beautiful amethyst necklace. There are nine lightly included amethysts measuring from 10mm long up to 15mm long at the center of the necklace. See a full view of this genuine amethyst necklace. The necklace is solid 925 sterling silver, and it is adjustable in length up to 18.5 inches long. The upper surfaces of these beautiful amethyst rough pieces are completely natural, and the backs were sawn flat and then bezel set. They have wonderful deep purple natural color. This natural amethyst jewelry design is unheated and untreated! Natural amethyst rough pieces with rich purple natural color were bezel set with open backs in this beautiful amethyst necklace. 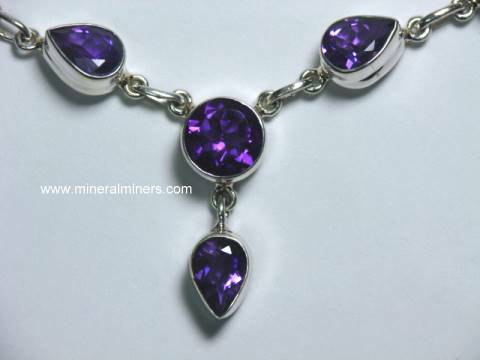 There are nine lightly included amethysts measuring from 10mm across up to 18mm across at the center of the necklace. See a full view of this genuine amethyst necklace. The necklace is solid 925 sterling silver, and it is adjustable in length up to 18.5 inches long. The upper surfaces of these beautiful amethyst rough pieces are completely natural, and the backs were sawn flat. They have wonderful deep purple natural color. This natural amethyst jewelry design is unheated and untreated! Natural amethyst crystals of superior quality with fine deep purple natural color were handcrafted into faceted pear shape gemstones and then set in this beautiful amethyst necklace. There are eight amethyst gemstones measuring 12x8mm each, and a beautiful 14x9mm amethyst gem in the center. See a full view of this genuine amethyst necklace. The necklace is solid 925 sterling silver, and it is adjustable in length up to 19 inches long. These beautiful amethyst gemstones face up clean, and they have wonderful deep purple natural color. This natural amethyst jewelry design is unheated and untreated! Set with 34 carats of faceted amethyst gemstones! Natural amethyst crystals of superior quality with fine deep purple natural color were handcrafted into faceted gemstones and then set in this beautiful amethyst necklace. There are eight oval shaped amethyst gemstones measuring 11x9mm each, a 10x7mm pear shape dangling below, and a beautiful 13x10mm oval faceted amethyst gem in the center. See a full view of this genuine amethyst necklace. The necklace is solid 925 sterling silver, and it is adjustable in length up to 19 inches long. These beautiful amethyst gemstones face up clean, and they have wonderful deep purple natural color. This natural amethyst jewelry design is unheated and untreated! Natural color amethyst pieces were shaped and faceted by hand, and then drilled and strung in this 18 inch long genuine amethyst necklace with an additional 3 inch long sterling silver extender & clasp. These beautiful amethyst beads are lightly included to eye clean, and they have wonderful medium dark purple natural color. This natural amethyst jewelry design is unheated and untreated! There also is a 2.5mm faceted amethyst bead strung between each of the larger faceted amethyst beads which are gradational in size, measuring 12mm long at the clasp and increasing up to 14mm long in the center of the necklace. The photo at left shows a close-up view. See also a full view of this genuine amethyst jewelry design. Amethyst Mineral Specimen Dimensions: 13" x 10.5" x 9.5"
This natural color Brazilian amethyst decorator specimen has intergrown layers of light to dark amethyst and white quartz layers in between. Natural amethyst with these patterns is known as chevron amethyst. See also and opposite side view of this beautiful chevron amethyst decorator mineral specimen. This natural color Brazilian amethyst decorator specimen is lapidary grade and has intergrown layers of light to dark amethyst and white quartz layers in between. Natural amethyst with these patterns is known as chevron amethyst. This beautiful decorator specimen stands up in the position shown. See also and opposite side view of this extra large size chevron amethyst decorator mineral specimen. 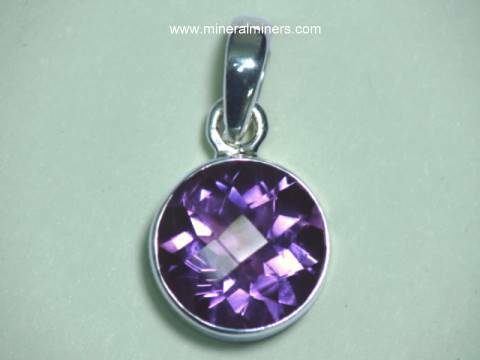 This large size amethyst jewelry pendant was handcrafted in sterling silver with an open back setting. 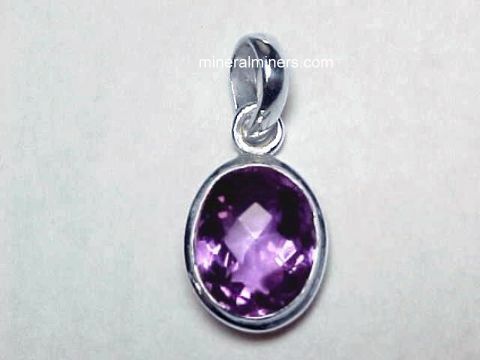 This genuine amethyst pendant is set with a 19x16mm checkerboard cushion shaped gemstone of natural amethyst with beautiful light purple natural color weighing 22 carats. 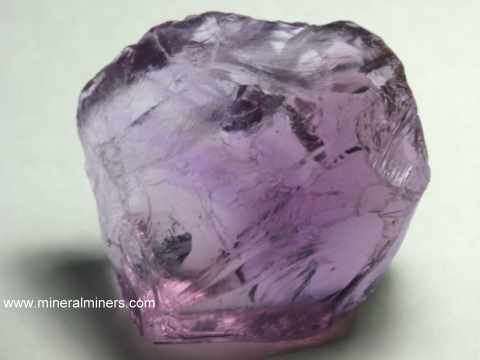 This natural light purple amethyst color is popularly known as Rose de France amethyst. Natural amethyst gem weighs 36 carats! This large amethyst pendant was handcrafted in sterling silver with an open back setting. This natural amethyst jewelry design is set with a 28x18mm oval faceted gemstone of natural amethyst with beautiful light to medium purple natural color weighing 36 carats! This 3.2 inch amethyst sphere is mostly cloudy with some transparent areas. It has light to medium purple natural color with some white areas. This 3.1 inch amethyst sphere is mostly transparent with some cloudy areas and some large gem-grade areas inside. It has light to medium purple natural color. 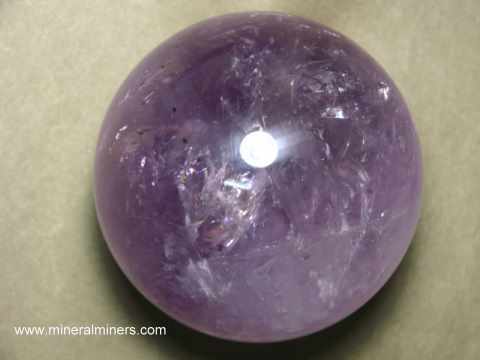 This rare size amethyst sphere is mostly cloudy with some transparent areas. It has light to medium purple natural color. This rare size amethyst sphere measures 3.6 inches in diameter. It has dark purple natural color with some white areas. This amethyst sphere was handcrafted from a natural amethyst crystal that was mined in Brazil. This beautiful amethyst sphere is semi-transparent to transparent with some large gem-grade areas inside! This beautiful citrine with amethyst pendant was handcrafted in 925 sterling silver with open back settings and then set at the top with a 14x10mm oval checkerboard faceted gem of lemon citrine, and with a 12x8mm faceted pear shape gem of natural amethyst with beautiful medium purple natural color. This fine quality amethyst pendant is set with a 14x10mm checkerboard oval faceted gem of untreated amethyst, and with a 13x10mm pear shape checkerboard faceted amethyst gem, both with very beautiful medium purple natural color. This genuine amethyst jewelry design was handcrafted in 925 sterling silver with open back settings and has 12 carats total weight of superior quality natural amethyst gemstones. This extra rare size amethyst sphere measures 5.3 inches in diameter! See also an opposite side view of this unique amethyst sphere. 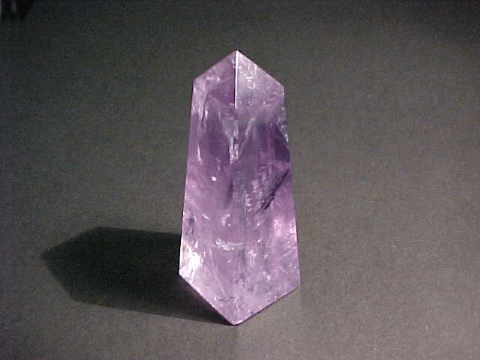 It has areas with medium and dark purple natural color with some white cloudy areas, and it is semi-transparent. 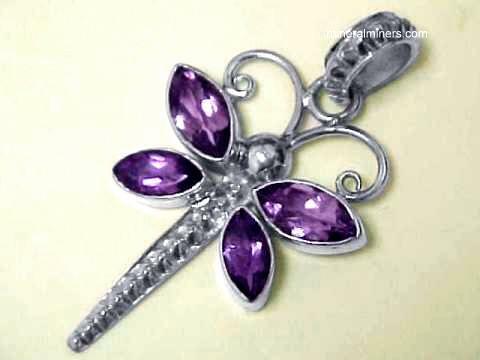 This wonderful amethyst pendant was handcrafted in sterling silver and set with three faceted gemstones of untreated amethyst with fine purple natural color; a 12x10mm checkerboard cushion cut at the top, a 10mm square checkerboard cushion cut in the center, and with a 7mm checkerboard trillion cut at the bottom! This natural amethyst jewelry design has 12.5 carats total weight of superior quality faceted amethyst gemstones. 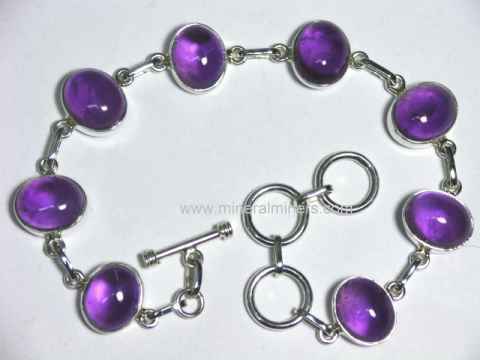 This natural amethyst bracelet is set with eight amethyst cabochon gemstones. This natural amethyst jewelry design has four 10x8mm oval cabochon gems & four 8mm round cabochon gems; all of semi-transparent untreated amethyst with beautiful deep purple color natural color. See also a full view of this natural amethyst jewelry design. The 12x10mm rectangular faceted checkerboard-top gems in these beautiful amethyst earrings weigh 16 carats total weight (8 carats each!). 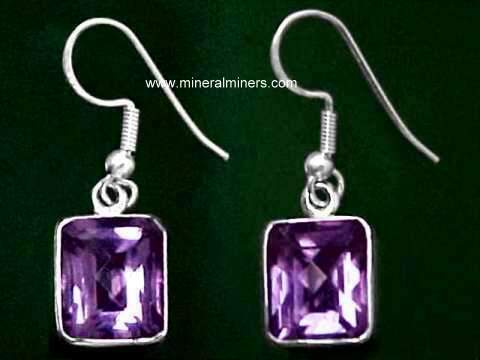 These superior quality amethyst earrings are very well cut, and they have rich medium-dark purple natural color. This natural amethyst jewelry design was handcrafted into sterling silver earwire dangle earrings with open back settings. This beautiful amethyst bracelet was handcrafted in 925 sterling silver and set with eight oval faceted gems of untreated amethyst measuring 11x19mm each with amazing deep-purple natural color. These eight lovely amethyst gems in this natural amethyst jewelry design weigh 28 carats total weight! See also a full view of this natural dark amethyst bracelet. This natural amethyst bracelet is set with eleven 9x7mm cabochon gems of semi-transparent untreated amethyst with beautiful deep purple natural color. This genuine amethyst jewelry design was handcrafted in sterling silver. See also a full view of this natural amethyst bracelet. This carved amethyst bracelet is set with nine hand-carved natural amethyst gems each measuring 20mm long! These lightly included amethyst gems are untreated with beautiful medium-dark purple natural color. They each have a unique hand-carved flower design on top. This genuine amethyst jewelry design was handcrafted in 925 sterling silver. See also a full view of this hand-carved natural amethyst jewelry design. This pear shape amethyst bracelet was handcrafted in sterling silver and set with eleven faceted gems of untreated amethyst measuring 9x6mm each. The faceted gems in this natural amethyst jewelry design weigh 14 carats total weight. See also a full view of this pear shape amethyst jewelry design. This heavy sterling silver amethyst ring is set with a fine quality faceted gemstone of natural untreated amethyst weighing 12 carats with beautiful dark purple natural color. The genuine amethyst gemstone in this ring was faceted in a 17x13mm checkerboard top oval cut from a natural amethyst crystal with fine dark purple natural color that was mined in Brazil. The photo at left shows a front and top-view photo of this large amethyst ring, see also a side view of this handcrafted amethyst jewelry design. Natural amethyst ring set with a 23 carat cabochon gem! 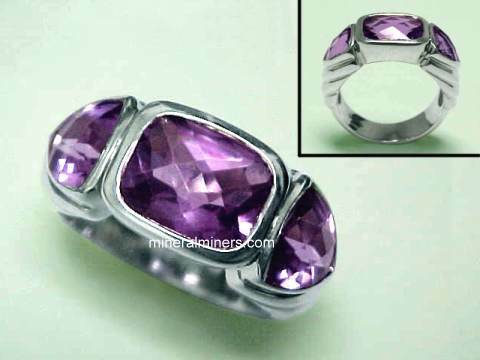 This heavy sterling silver amethyst ring has over 1/3 ounce of 925 sterling silver. It is set with a 22x16mmmm oval shape cabochon gem of lightly included untreated amethyst with amazing deep purple natural color! The photo at left shows a top-view photo, see also a side view of this handcrafted amethyst ring. This fine quality ring was handcrafted in pure 925 sterling silver. It can be worn by a man or a woman. Natural amethyst ring set with a 20 carat cabochon gem! This extra heavy sterling silver amethyst ring has 1/2 ounce of pure 925 sterling silver! This ring is set with a 20 x16mmmm oval shape cabochon gem of lightly included untreated amethyst with amazing deep purple natural color! The photo at left shows a top-view photo, see also a side view of this handcrafted amethyst ring. This fine quality amethyst ring can be worn by a man or a woman. This beautiful pair of dark amethyst earrings is set with 13x8mm natural amethyst briolette faceted gemstones weighing 4.5 carats each. These superior quality amethyst gemstones have wonderful dark purple natural color! These genuine amethysts are unheated and untreated. This natural amethyst jewelry design was handcrafted into 925 sterling silver earwire dangle earrings and then each was set at the top with a 3.5mm faceted bead of natural color amethyst. See also another view of these natural color amethyst earrings. The 10x7mm pear shape faceted gems in these beautiful amethyst earrings were cut and polished from natural amethyst crystals mined in Brazil. These untreated amethyst gemstones are eye clean, and they have beautiful medium-dark purple natural color. This natural amethyst jewelry design was handcrafted in sterling silver earwire dangle earrings with open back settings. See also a full view of this natural amethyst jewelry design. The 11x9mm rectangular shape faceted gems in these amethyst earrings were cut and polished from natural amethyst crystals mined in Brazil. These untreated amethyst gemstones are eye clean, and they have beautiful medium-dark purple natural color. This natural amethyst jewelry design was handcrafted in 925 sterling silver earwire dangle earrings with open back settings. See also a full view of these natural amethyst earrings. These dark amethyst earrings are set with 7x5mm natural amethyst gems that were cut and polished from natural amethyst crystals mined in Brazil. These untreated amethyst gemstones face up eye clean, with faint natural inclusions only visible under close inspection with bright illumination. They have amazing dark purple natural color. This natural amethyst jewelry design was handcrafted in 925 sterling silver earwire dangle earrings with open back bezel settings. These dark amethyst earrings are set with 8x6mm natural amethyst gems that were cut and polished from natural amethyst crystals mined in Brazil. These untreated amethyst gemstones face up eye clean, with faint natural inclusions only visible under close inspection with bright illumination. They have fine dark purple natural color. This natural amethyst jewelry design was handcrafted in 925 sterling silver earwire dangle earrings with open back bezel settings. These dark amethyst earrings are set with pear shaped 8x6mm faceted gems of natural amethyst that were cut and polished from natural amethyst crystals mined in Brazil. These untreated amethyst gemstones face up eye clean, with faint natural inclusions only visible under close inspection with bright illumination. They have fine dark purple natural color. This natural amethyst jewelry design was handcrafted in 925 sterling silver earwire dangle earrings with open back bezel settings. Each of these untreated amethyst earrings was handcrafted in sterling silver earwire dangles and set with five faceted amethyst gemstones: two 3mm rounds, a 7x5mm oval, an 8x4mm marquis shape, and a 10x7mm pear shape. These natural amethyst earrings have beautiful light to medium purple natural color. Each of these natural amethyst earrings was handcrafted into sterling silver earwire dangles and set with two faceted amethyst gemstones: a 6mm round, and an 10x7mm pear shape. These untreated amethyst gemstones have beautiful medium purple natural color. The 9mm checkerboard square cushion cut faceted gems in these genuine amethyst earrings weigh 8 carats total weight (4 carats each!). 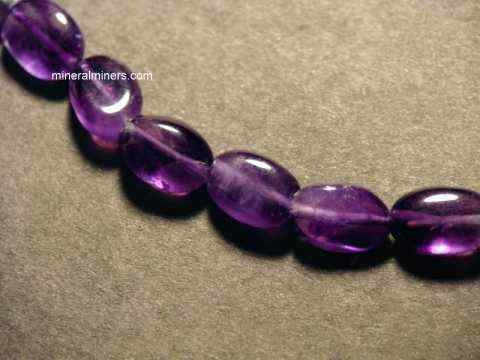 These superior quality amethyst gems are very well faceted and they have wonderful medium-dark purple natural color. These untreated amethyst earrings were handcrafted in 925 sterling silver earwire dangles. The 11mm square cushion checkerboard faceted gemstones in these beautiful amethyst earrings weigh 14 carats total weight (7 carats each!). 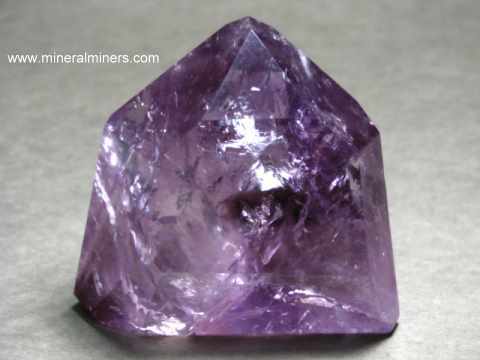 These superior quality amethyst gems are very well faceted and they have wonderful medium-dark purple natural color. These untreated amethyst earrings were handcrafted in 925 sterling silver earwire dangles with open back settings. Natural amethyst earrings with 12 carats total gem weight for the pair! The 14x10mm checkerboard oval faceted gems in these amethyst earrings were cut and polished from natural amethyst crystals mined in Brazil. These untreated amethyst gemstones face up eye clean, with very faint natural inclusions only visible under close inspection with bright illumination. They have beautiful medium-dark purple natural color. This natural amethyst jewelry design was handcrafted in 925 sterling silver earwire dangle earrings with open back settings. 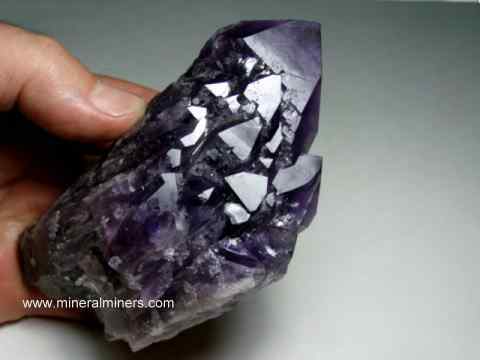 Our Amethyst Items are all 100% natural color - they have not been heated or treated in any way! See also our selection of genuine natural color amethyst gemstones. 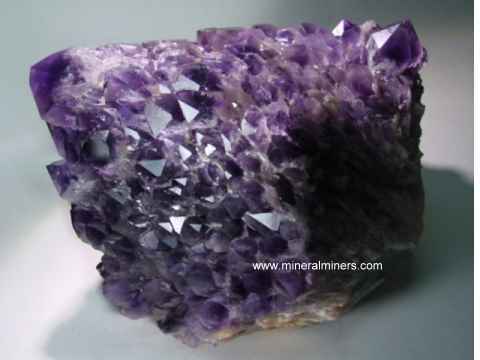 We have been mining for amethyst, aquamarine, topaz, citrine, tourmaline & other gems in Brazil for more than 30 years. We do have more natural color amethyst spheres & natural color citrine spheres in stock, as well as natural color amethyst crystals and natural quartz crystal balls. 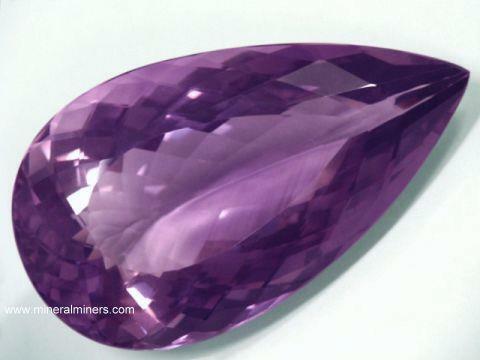 See also our selection of natural color ametrine gemstones. 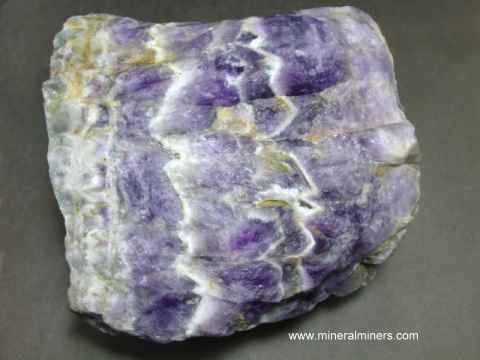 Would you like us to inform you when we add on this page more natural amethyst gems, mineral specimens and jewelry items of superior quality? We have a large inventory of natural amethyst items in stock at our mineral warehouses, so be sure to let us know if you have any natural amethyst special requests.